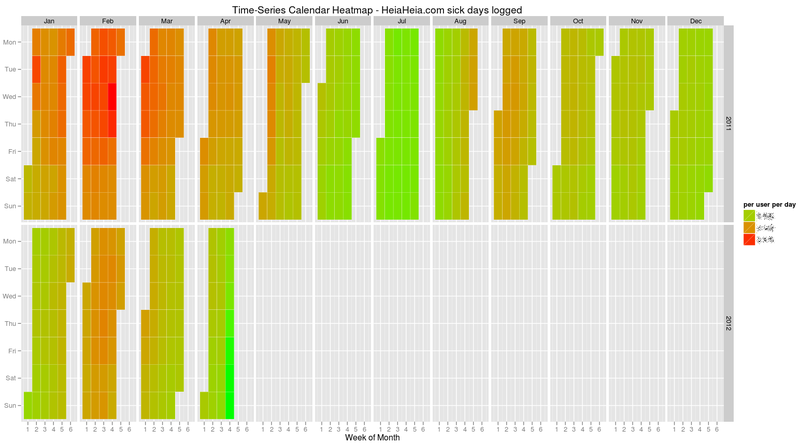 Inspired by Margintale’s post “ggplot2 Time Series Heatmaps” and Google Flu Trends I decided to use a heat map to visualize sick days logged by HeiaHeia.com Finnish users. I got the data from our database, filtering results by country (Finnish users only) in a tab separated form with the first line as the header. Three columns contained date, count of sick days logged on that date and count of Finnish users in the service on that date. Here are the results. Green indicates the healthiest days with lowest values of sick days logged per user, red indicates the worst days with highest values of sick days logged per user. It’s quite clear that there are seasonal peaks around February, and 2011 was a lot worse than 2012 (one should note that January-February of 2011 were exceptionally cold in Finland). It matches quite well with the coverage in the national press: Flu season reaching peak (Feb’2012), Employers grapple with sick leaves brought by flu wave (Feb’2012). It’s interesting that there are less sick days logged on the weekends than on the work days, and traditional holiday month of July is the healthiest month of all. To get a more formal validation of the data logged by HeiaHeia users, I used Google Correlate lab tool to check that heat map results make sense. 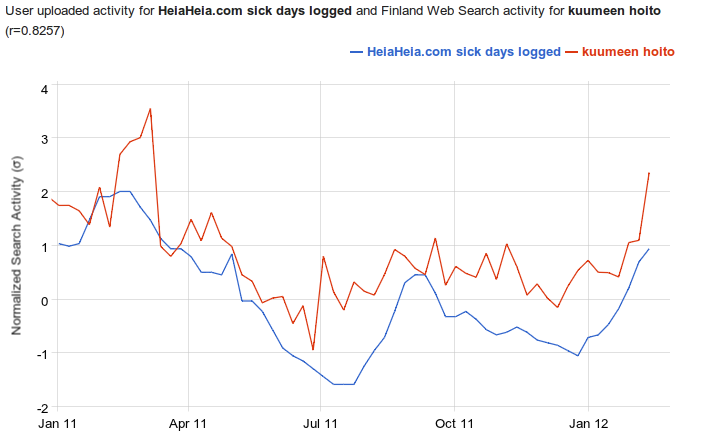 I uploaded sick days per user weekly time series and plotted a correlation with Google search queries for “kuumeen hoito” (treatment of fever in Finnish). Pearson Correlation Coefficient r between HeiaHeia sick days time series and Google search activity σ (both normalized so that mean is 0 and standard deviation is 1) is 0.8257 – this is a pretty good match. HeiaHeia – probably the most fun way to keep fit! Wow, what an autumn it has been! It has come and gone so fast. By Christmas 2009 a major milestone was reached – Moozement moved from Alpha to Beta phase. Most of my time and efforts went into development of the service – and it was exciting time of super intensive work in a small, but very dedicated team. Beta version brought with it new professional design, easier to use interface, new interaction concepts, new sports, new faster servers. We decided to change the name of the service as well and were inspired by a hypnotic Heia! Heia! chant that Norwegians use to support their cross-country skiers and other athletes. We named our service HeiaHeia to give it a spell of positive cheering among friends. Sports and wellbeing are hot markets both regarding hardware and web service innovation. HeiaHeia’s focus is on the social aspect of sports – mastering the ways in which friends can motivate each other in a positive spirit, without being overly competitive. The difference between us and most of the other players is that we want to provide a service which anybody can use. You don’t need any kind of technical gear to use the service, and the service itself is as easy to use as Facebook. The HeiaHeia philosophy on sports is that everything counts. HeiaHeia already supports over 250 different types of sports, most of them requested by users of the service. Understanding user behaviour and user requests will remain a guiding principle in the development of HeiaHeia. Work doesn’t stop here, and new functionalities will be introduced on a weekly basis going forward, in a true Web 2.0 mode of development.We are looking forward to a very exciting year ahead. Author Ivan KuznetsovPosted on January 16, 2010 Categories HeiaHeia3 Comments on HeiaHeia – probably the most fun way to keep fit! Last year I got involved in the development of a new social network – Moozement. There are plenty of social networks out there, there are even white label social networks. So why create another one? Jyri Engeström wrote some time ago about the case for object-centered sociality: “‘social networking’ makes little sense if we leave out the objects that mediate the ties between people”. I could not agree with him more. The glue of each community is something that unites them – common interest, social object. When you join new social network, you typically start by building your social graph – re-establishing links to the real people you know, checking if they have already registered, inviting those whom you would like to see in the new environment. But there must be something beyond the initial phase of building the social graph. And this is the problem that haunts giants like Facebook and MySpace. You cannot possibly have common interest with everyone, and you don’t want to share the same things with everyone.